The report constitutes of detailed analysis of the global automotive supercapacitor market in terms of various automotive sub-systems, automotive application types, and future scope in the electric vehicle technology. The global battery market is the parent market for supercapacitor type of energy management solution. It caters to the high-power requirement of vehicle on-board. The supercapacitor technology companies have worked extensively to develop an optimum between high-power ability and moderate energy density. The report discusses various system types such as starting, lighting and ignition systems, start-stop system, battery propulsion system, kinetic energy recovery system, and others for automotive applications. The report also explores various opportunities for existing supercapacitor technology in the automotive industry as well as innovative supercapacitor concepts, which could disrupt the li-ion battery market. A detailed analysis of the regional market ecosystem plays a vital role is determining a consumer mindset for selecting a service offering. On-board electric power has been an important factor for a vehicle design. The growing need for efficient battery products for electric and hybrid vehicles has resulted in the innovation of supercapacitor-based battery solution. Supercapacitors are an alternative to high-power pulse battery, and also have longer shelf life in comparison to conventional technologies. The energy density of supercapacitors is lower than that of batteries, but suprercapacitors have higher power density. The key factors accelerating the growth of supercapacitors within the automotive domain are growing vehicle on-board electric power requirement, demand of electric vehicle, development of autonomous vehicle systems and telematics, and connected vehicle systems. Major cost head in the supercapacitor assembly process is the technology research and development, which accounted for 55.0% of the overall supercapacitor assembly cost in 2018. The technology cost is expected to reduce as the market becomes matured with time. High level of innovation in terms of material science and module integration is likely to keep the costing slightly on the higher side during the forecast period 2018-2028. Globally, the transportation industry is undergoing a restructuring, driving technology research, innovative mobility options, and collaborative company network. The competition in the automotive industry has scaled to such a dramatic level that collaboration of companies is the most sought out option for mutual co-existence. A high investment is directed for research and development by OEM, energy management companies, and venture capital firms to fuel the value chain of supercapacitor market. Regionally, the world is divided into Americas, EMEA, and APAC. Each region varies in terms of environmental conditions, governments regulation, and demography pressure. The supercapacitor ecosystem has the presence of dominant energy management solution companies, pureplay companies, and startups. There are both private and public companies operating in the domain. A strong growth is expected for the emergence of private startup companies in the market during the period 2018-2028. • What is automotive supercapacitor technology? • What is the cost structure of automotive supercapacitor product? • What major factors are expected to impact the market positively and negatively during 2018-2028? • What are the potential applications of supercapacitors in automotive technology? • What factors have influenced the market penetration of supercapacitor technology in key countries? • What is the role of autonomous vehicles and electric vehicle in the growth of supercapacitors? • What are the key materials that are utilized as supercapacitor electrodes? • What are the future opportunities for supercapacitor manufacturers? • What is the forecast global market value for the period 2018-2028? 2.1.2 How is the Energy Stored in Supercapacitors? 2.1.5 How are the Supercapacitors Categorised? 10.7 Murata Manufacturing Co. Ltd.
10.12 Samsung SDI Co., Ltd. The transportation industry is an interconnected network of different transportation modes which create a value network for tire-1 and tire-2 suppliers in the automotive industry. The automotive industry is an economically sensitive industry, it is highly driven by the current trends such as environmental degradation, growing urban population, and rising disposable income, among others. Government regulations of a specific region play a vital role in determining the success of the initiatives and trends in the industry. Some of the important criterions which influencing the policy regulation are be regional socio-economic conditions, acceptance of technology, demographic conditions, infrastructure availability, and global economic conditions (such as fossil fuel prices, international trade agreements, environmental challenges, and financial health). The supercapacitors have multiple applications within the automotive supply chain. A supercapacitor is an advance form of capacitor, which is capable of holding large amount of electric charge at a time. There are several qualities, such as long shelf life, high power density and fast charging function, which make automotive application feasible. These key characteristics of a supercapacitor enables automotive applications in systems such as start-stop, light, ignition, kinetic energy recovery, adaptive suspension, electric, and hybrid vehicle drive support, among others. The automotive industry is currently focused on developing supercapacitor solution to be used as a mainstream electric power option in future vehicles. 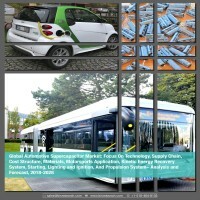 Major drivers for supercapacitor application within the automotive industry are electrification of vehicle, advance self-driving technology, and smart connected vehicles. The supply chain for automotive supercapacitors is categorized into six levels; component production, supercapacitor assembly, module assembly, package assembly, vehicle integration, and recycle. Component production includes raw material procurement and design and manufacturing process. The most dominant cost head is the raw material. Further, a supercapacitor technology manufacturer and developer might procure components partially or fully from outsourced vendor for assembly of a supercapacitor cell. These cells are arranged and modified to fit into a unit as per application requirements. Package Assembly level from an automotive OEM perspective has involvement of: tire-1 system supplier that integrates supercapacitor into a subsystem and supercapacitor module assembly that integrates supercapacitor cells and other components into a functional system for direct installation in the vehicle. During the final assembly of the vehicle, the sub-system or supercapacitor module is installed based upon the vehicle requirement. Electrochemical double layer capacitor (EDLC) has a major share in the automotive supercapacitor market. EDLC construction comprises two carbon-based capacitors, an electrolyte and a separator. Further, the advancement in the automated automotive systems has led the implementation of other types of supercapacitor categories such as hybrid type and pseudocapacitor type. The future scope for hybrid type supercapacitors is high for electric vehicles and autonomous vehicle applications. The growth in research and development of autonomous vehicle technology is led by tech giants such as Apple, Google, and Microsoft. The transportation ecosystem is undergoing transformation driven by technology research, innovative mobility options, and collaborative company network. In the automotive supercapacitor market, companies from Europe region, North America region and countries such as Japan, Australia and China attract high research and development investments. Key companies operating in the domain are Maxwell Technology, AVX Corporation, Panasonic Corporation, Samsung SDI, TDK, Honda, Hitachi Ltd, Nippon Chemical, Skeleton Technology, PBC corporation, Ioxus Inc., eSpin Technologies, CapXX Limited, Targray Technology, Global Graphene Group, VinaTech Co Ltd, LS Mtron Ultracapacitor, NAWATechnologies, and Yunasko Ltd, among others. The market is dominated by public players as most of the key technology leaders are operating in the industry for over 40 years. In the last decade (from 2008 to 2018), many startups have entered the supercapacitor technology ecosystem. As per market estimation, the number of startups in supercapacitor technologies is expected to grow, as automotive OEMs have shown keen interest in the technology. A major strategy in the industry for the expansion of capability and regional reach is mergers and acquisitions. As per the supercapacitor technology market system, it is expected that post 2030, supercapacitor modules will be present in over 65% of new vehicle sales as an additional electric energy system to reduce the main battery pack and enhance the power delivery efficiency.